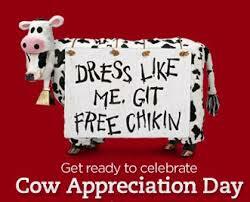 Today (July 11, 2017) is Cow Appreciation Day at Chik Fil A.... simply dress up as a cow, head in a get some free food. Don't have a cow costume? Wear a white t-shirt, cut out and tape on some black circles.. easy peasy!